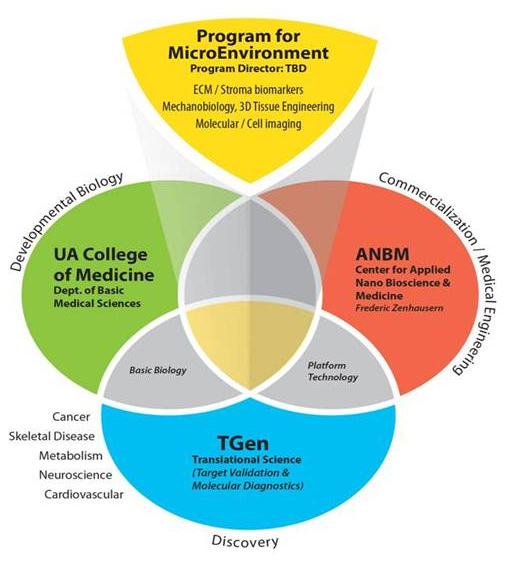 The Center’s interdisciplinary team of researchers are exploring through integrative approach and new design principles the development of 3D tissue-specific platforms for studying biological interactions at multi-scale. For example, these systems can be applied to discovering new drugs and predicting their clinical activity or investigating disbiosis of the hiuman microbiome and its interactions on human tissue. Although molecular medicine with its portfolio of disease biomarkers and biologics is evolving rapidly, there is still a lack of reliable predictive preclinical models to assess drug efficacy of these new agents. This initiative aims at designing and prototyping novel microphysiological system using a combination of technologies. For example our researchers are developing modular microfluidics-based devices that can allow the partitioned cultivation of organ-specific human cell lines and sampled human microbial communities. Such device architecture will allow us to establish in vitro models for the human proximal colon, the human gastrointestinal tract and human gastrointestinal tissue. The device can be processed using hybrid materials for 3D-nanostructuring surfaces and engineering specific tissue constructs within the devices. These modular platforms could be combined with sensing elements for real-time monitoring of the physiological microsystem. This approach is also applied to bone tissue remodeling for which understanding of osteocyte mechanotransduction is still hampered by the fact that current in vitro culture systems are lacking of the in vivo 3D physical and geometrical environments the osteocytes reside. The system mimics the unique structure and architecture of bone tissue in vivo, including both the lacunae-canaliculi porosity and vascular porosity. Moreover, different biomaterials for mineralized bone matrix can be processed to construct the device so that bone cell interaction with those materials and fluid and molecular transport in the microphysiological system can be studied while other fundamental questions regarding metastatic bone diseases can also be explored.